safely holding your instruments. Manufactured with heavy duty water retardant fabric. 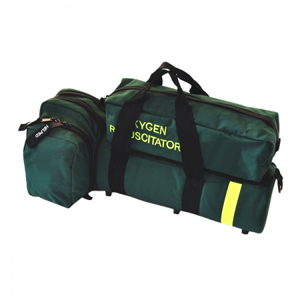 External straps wrap completely around bag for additional strength and durability. Comes complete with padded shoulder strap. pockets have reflective high-vis stripes. 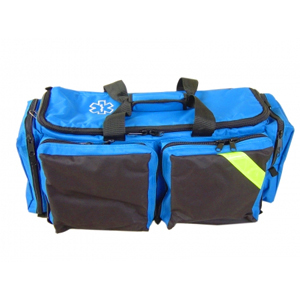 External straps wrap completely around bag for additional strength and durability. Side zipper pocket is 15 inches long with 3 inner pockets and 6 elastic instrument holders. Comes complete with padded shoulder strap. The Deluxe Oxygen Therapy Bag is the top of the line solution for carrying your complete Oxygen therapy Kit. 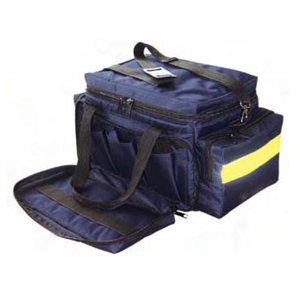 A large outer zipper pocket provides ample room for regulator, Resuscitator, tubing, masks and all other accessories. This bag is ergonomically designed for use as a shoulder bag or briefcase style. It includes a large main compartment, mesh pockets, and specifically designed compartments throughout for emergency response accessories. It has ample room to neatly carry all essential Oxygen therapy apparatus including fitted regulator and C size cylinder. 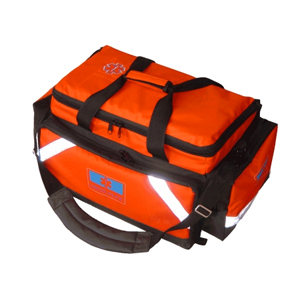 Bag comes complete with shoulder carrying straps and High Vis Reflective straps.